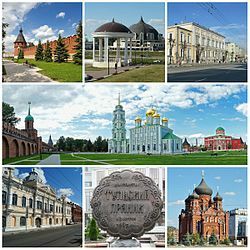 Tula (Roushie: Тула) is an industrial ceety an the admeenistrative centre o Tula Oblast, Roushie, locatit 193 kilometers (120 mi) sooth o Moscow, on the Upa River. Population: 501,169 (2010 Census); 481,216 (2002 Census); 539,980 (1989 Census). ↑ Tokarev, Kirill (4 October 2011). "Tula: Loved by Tolstoy, hated by Lenin". Russia & India Report (in Inglis). Russia Beyond the Headlines. Retrieved 31 August 2016. ↑ "Всего три побратима Тулы осталось в мире". Tula.rfn.ru. 2005-04-29. Retrieved March 23, 2012. This page wis last eeditit on 11 Februar 2019, at 06:00.